Today I want to write about a very colourful species of parrot, the military macaw. The beautiful birds grow up to 70 cm long and have green feathers, a red face and black beak. When they fly, they show off their bright red and blue tail feathers and blue flight feathers, making them one of the most colourful birds in the world. They get their name as their markings looks like a military uniform. Military macaws mainly eat seeds, nuts, fruits and berries, using their very strong beak to break even the toughest nuts. They regularly visit clay banks on the edge of rivers. They eat small amounts of clay to help them cope with any poison that is in the food that they eat. They can live for up to 60 years, are very noisy and often gather in large groups, nesting in large trees or on high cliff faces. 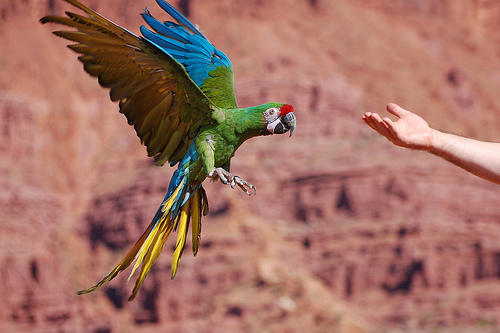 Military macaws are found in Mexico, Bolivia, Argentina, Peru, Venezuela, Colombia and Ecuador. They are considered vulnerable to extinction due to habitat loss and poaching for the pet trade. Are there any other interesting facts that you would like to share about military macaws?